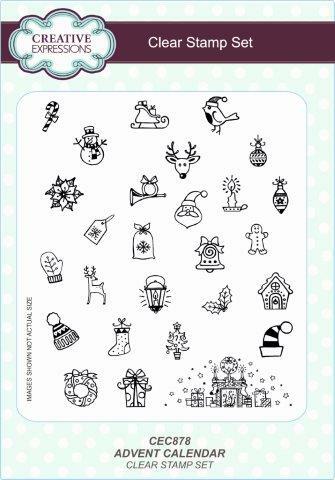 A set of 27 Christmas themed mini stamps which not only co-ordinate perfectly with the Advent Calendar die set they can also be used in all your Christmas craft makes such as cards, gift tags, decorations and packaging. The set is A5 size overall with individual stamps varying in size but averaging approximately 1.5 x 2.5cm (0.6 x 1.0 inches). This stamp can be purchased separately or save £3.55 by buying the Advent Calendar Making Kit, which also includes the Advent Calendar Die Cutting Set and a pack of self adhesive Calendar Hangers.